Dan always knew he wanted to rock. 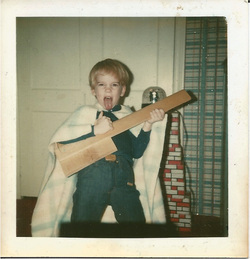 At first he wanted to be Gene Simmons. After a couple of years of piano lessons when he was eight, Dan’s mom bought him his first guitar for his twelfth birthday. The sunburst Cort strat knock-off was the touchstone that began several years of instruction with Bob Grecco and John Frank. Along the way, school friends were figuring things out on their own instruments and much jamming ensued. Musical influences at this point included: The Beatles, Van Halen, and Led Zeppelin. Liquid Time was the band that materialized in high school. Guitars around this time were the red Kramer Focus 1000 and the blue Ibanez RG550 played through a Crate G60 with a 12 inch Celestion. Middle School dances at Knollwood and Point Rd. and parties were the first gigs ever. A band called Aura, formed at the University of Delaware, was next with bigger gigs and recording. After college the band Progres found Dan expanding as an artist in an original music setting. DMB, Phish, and Beethoven were in heavy rotation at this time. Dan purchased the purple Paul Reed Smith Custom in 1995. In 1998 Dan co-founded The Wag. Over the next 13 years they recorded six cds and played 350 shows. Highlights included warming up for Rick Springfield at a sold out Count Basie Theater and having Springsteen carry Dan’s amp after opening up for The Wag. Thanks Bruce! After one rehearsal, a bunch of guys played the KDM race after party in March 2011 with Bobby Bandiera sitting in...The Haven was born. Soon after, in July 2011, Dan became the Contemporary Worship Leader at Tower Hill Church in Red Bank.